Our church is in the middle of a sermon series about seeing work thru God's eyes instead of the world's. 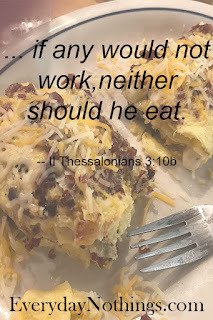 One of the verses we've been discussing is II Thessalonians 3:10, where it says that anyone isn't willing to work, should not be fed either. It's an interesting verse, especially in today's society. Of course, we want to make sure it's clear that this doesn't apply to those who for one reason or another are not able to work, but to those that choose not to work. Anywho... one of my friends said that when she got frustrated with her kids not doing their chores, she posted this verse on their fridge and told them if they didn't do their chores, the wouldn't eat dinner. Period. I like the idea, and am tucking it in my back pocket. Maybe wait until my kids get a little older. Jillian might be a little young to force this on, at 3 years old. But the idea is sound, I think. As my friend put it, it may seem harsh, but if she can drill it in their heads now that if they want to eat they need to work, then hopefully as the become adults that will still ring true in their minds and they will grow up understanding that work is part of life, work feeds, work provides.